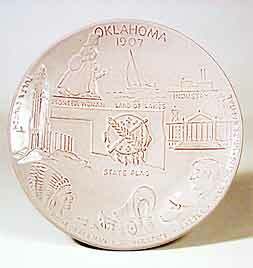 Oklahoma plate - 8½" (215 mm) diameter. John Frank set up the Frank Potteries in Norman, Oklahoma in 1933. He was a professor in the Ceramic Art Department of the University of Oklahoma, having moved after graduating from the Art Institute of Chicago in 1927. In 1936 he resigned from the university in order to spend more time at his pottery. The name was changed, at his wife's suggestion, to Frankoma Pottery, and in 1938 the company moved to Sapulpa, Oklahoma. Within a short time the new factory was destroyed by fire, but production was soon restored and Frankoma built a sound reputation with their high quality domestic, decorative and commemorative wares. From the time John opened in Norman he used a pale clay from Ada. His desire to make pots in Oklahoma stemmed from having taken part in a geological survey of clays for the university. He continued using the Ada clay until 1954 when he changed to a red earthenware clay dug locally in Sapulpa. When John Frank died in 1973 the business transferred to his daughter, Joniece, who continued to run it until she sold the company to its present owners in 1991.